"Let’s dance and exorcise some cash registers! 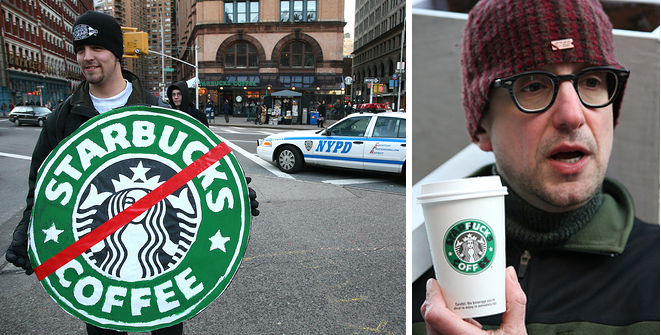 Confront Starbucks for stealing the trademarks of Ethiopia’s ancient coffees, like Sidamo and Harar. Honor the destitute farmers by defeating the $4 latte!" Hmm, something tells us that it'll take more than some "clever" crossing out of letters and logos to defeat the caramel coffee goodness. It may not defeat the coffee giant, but I bet there's a bunch of people reading this post who may think twice about it. Just a little dent in the armor.